Image caption Chaidh co-dhùnadh son prìs an dealain a thoirt às na h-eileanan a chur air ais dhan Mhàirt 2014. Tha eòlaiche air cumhachd ath-nuadhachail ag ràdh gu bheil cothrom ann fhathast do na h-eileanan buannachd a dhèanamh às a' chumhachd. Tha Murchadh Moireach ag ràdh gum faodadh seo tachairt fhathast a dh'aindeoin droch naidheachd a th'air nochdadh anns na seachdainnean a chaidh seachad. Thuirt e gu feum a h-uile buidheann a tha an-sàs anns a' ghnìomhachas iomairt làidir a chur air chois leis an dà Riaghaltas airson suidheachadh fàbharrach fhaighinn do na h-eileanan. Ach tha e cuideachd air rabhadh a thoirt gur e an cothrom mu dheireadh a tha seo do na h-eileanan ge-tà. Aig toiseach na Dùbhlachd, dhearbh riaghaltas Bhreatainn gum bi taic-arigid son cumhachd ath-nuadhachail sna h-eileanan air a shuidheachadh aig £115 gach megawatt. Tha luchd-leasachaidh nan tuathan gaoithe a' cumail a-mach gu bheil sin ro ìosal. 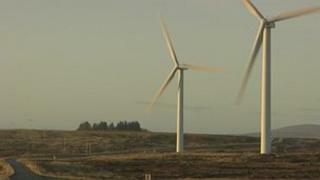 Bhathar an uairsin a' feitheamh gus an stèidheachadh riaghaladair a' chumhachd OFGEM a' phrìs airson an dealan a thoirt às na h-eileanan. Bheireadh sin cothrom do luchd-leasachaidh obrachadh a-mach am b' urrainn dhaibh prothaid a dhèanamh à cruthachadh dealain anns na h-eileanan. Chaidh an co-dhùnadh sin a chur air ais dhan Mhàirt 2014 agus tha a' fàgail iomagain air cuid gu bheil cothrom nan eilean siar seachad. Ach chan ann mar seo a tha an t-eòlaiche cumhachd Murchadh Moireach a' coimhead air a' ghnothach. Image caption Tha Murchadh Moireach den bheachd gu bheil seo a' toirt cothrom don dà riaghaltas sùil eile a thoirt air a' chùis. "Tha 'strike price' a-nis air a dhaigneachadh leis an riaghaltas agus chan eil e cho freagarrach do na h-eileanan an iar gu sònraichte", thuirt e.
"Agus mura robh sin gu bhith fàbharach, bha sin a' dol a mharbhadh a h-uile càil a bh' ann. "A-nise, 's e am beachd a tha mise a' gabhail air a seo, uill tha sin actually a' toirt cothrom dhan dà riaghaltas agus an gnìomhachas agus daoine timcheall air sùil eile a thoirt. Ach tha an t-eòlaiche cumhachd cuideachd air rabhadh a thoirt do gach taobh anns an deasbad. "'s tha mi den bheachd gur e an cothrom mu dheireadh a th' ann. "Agus gum feumte tighinn gu co-dhùnadh gu math luath anns a' bhliadhna a tha romhainn air cosgaisean ceangail son rudan ath-nuadhachail anns na h-eileanan siar. "Ach tha an cothrom ann agus 's e mo bheachdsa nam biodh idir a' coimhead ris na h-eileanan siar, mar eisimpleir... mar 'offshore energy farm', bheireadh e dòigh beachadh eile dhaibh, agus 's dòcha gun toireadh e cothrom thighinn gu co-dhùnaidhean na bu fhàbharaiche dhan gnìomhachas a-muigh an seo.